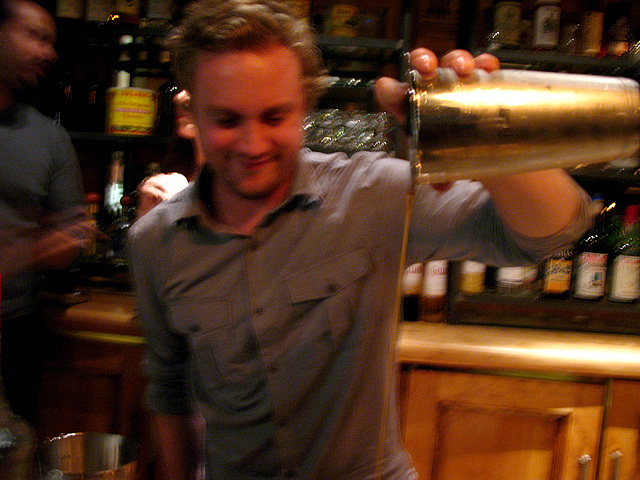 Julian Cox, during a preview night at Sotto. After a weekend of previews and a final event on Tuesday night, Chefs Steve Samson and Zach Pollack are scheduled to open their Italian restaurant Sotto on Wednesday, March 30th. Sotto is opening in the space that formerly housed Test Kitchen, the celebrated über pop-up restaurant located in the ground floor of what is now known as The Townhouse on Pico. 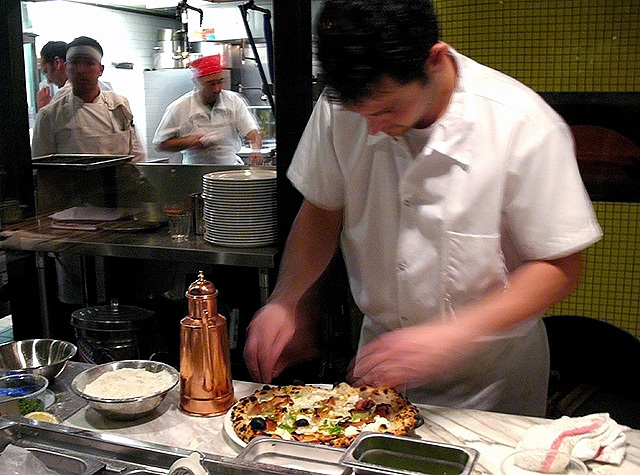 Sotto will feature Samson and Pollack’s menu of regionally-inspired Southern Italian dishes, including fresh house-made pastas and Neapolitan pizzas cooked in a handcrafted wood burning oven, reportedly the first of its kind in the Los Angeles area. To complement the market-driven cuisine, Julian Cox (Playa, Rivera) is creating a cocktail menu and curating a spirits selection that showcases the bitter Italian herbal liqueurs known as amari. Cox is very familiar with the Sotto space, having been Test Kitchen’s bar manager for the duration of its four month run. With Sotto’s opening fast approaching, Cox invited me to stop by his latest endeavor during a busy friends and family night. Your photo would be blurry too, if you just did a shot of Zedda Piras. Test Kitchen regulars will likely be startled by the dining room’s transformation: the lighting has been dimmed; a dark palette of brown and black replaces Test Kitchen’s brighter tones; wooden ceiling beams and raw tabletops add an elemental touch; new additions include common tables and a wine bottle wall. One thing that hasn’t changed is the room’s vibrant energy, as if you’re stepping into a lively dinner party where all of the guests have known each other for ages. 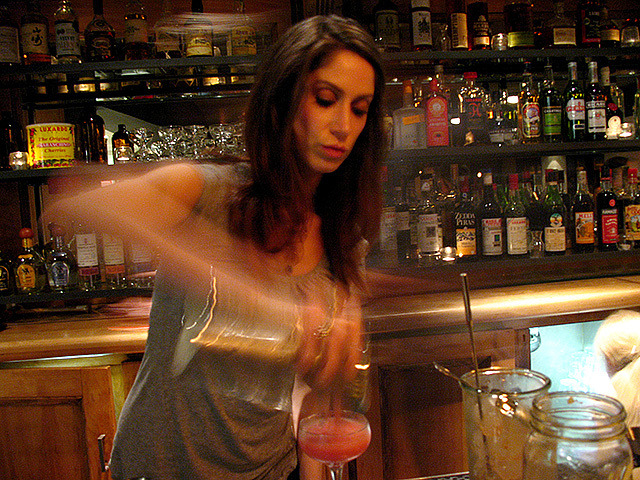 Brian Summers and Kate Grutman, who were both members of Cox’s opening team at Playa, are joining him at Sotto and were kept busy mixing drinks from the preview’s menu of three cocktails. Although Cox will be splitting his time between Sotto and Playa, Summers and Grutman will be at Sotto full time. With a broad smile from behind the bar, Cox proudly showed off the re-designed digs, starting with the new zinc bar top, which he said will develop a patina over time as it ages. The elegant bar top extends to the far wall and turns the corner, so guests will now be able to dine from the best seats in the house to watch the open kitchen in action. 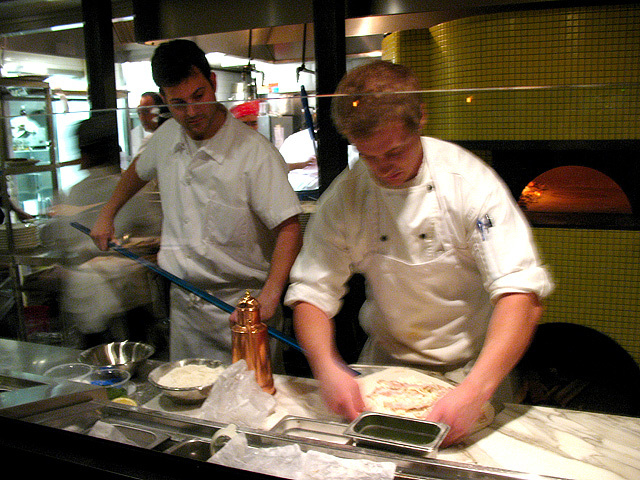 From my corner bar stool it was easy to see the buzz of activity surrounding the artisanal oven. As described in Squid Ink, third-generation oven-builder Stefano Ferrara hand built Sotto’s oven with materials imported from Naples. The back bar at Sotto, a work in progress. Custom brushed metal racks have been installed for the back bar, a work in progress that’s opening with 18 amari filling one shelf (“the usual suspects for now,” as Cox put it), a bitters collection taking up another, and some leftover Test Kitchen inventory rounding out the selection. 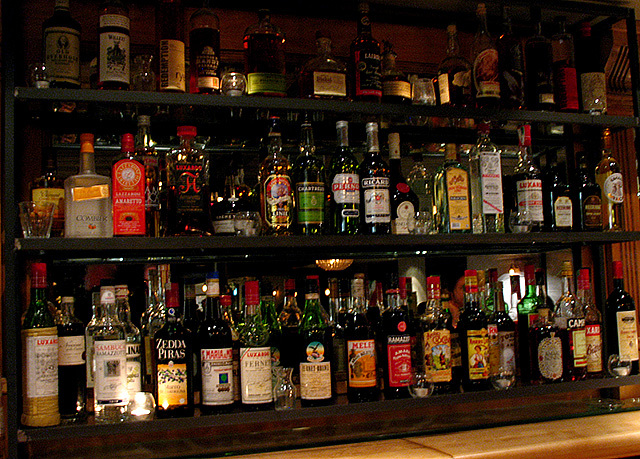 As with Playa’s Great Wall of Booze, Cox will use LEDs to illuminate Sotto’s back bar. Cox pointed out the Italian mixing glasses, inspired by Sotto’s Mediterranean vibe. Regarding the spirits displayed on the back bar, Cox half-jokingly said, “There are no mezcals up there…for a reason.” It’s not that Cox is abandoning the agave-based spirits and cocktails that first won him acclaim at Rivera and more recently at Playa. 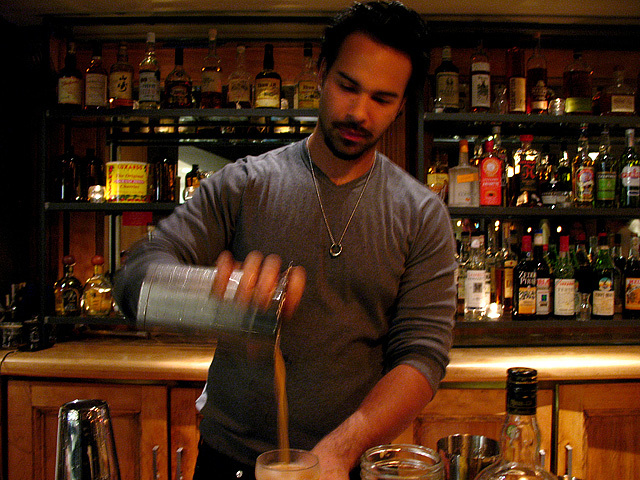 In fact, he’s about to debut Rivera’s Spring Cocktail Menu with one of his popular late night launch parties, and is working on new cocktails for Playa. But like an actor typecast into a role, Cox has been eager to expand his cocktail repertoire beyond his familiar tequila-mezcal orbit, and his enthusiasm about Sotto was evident. 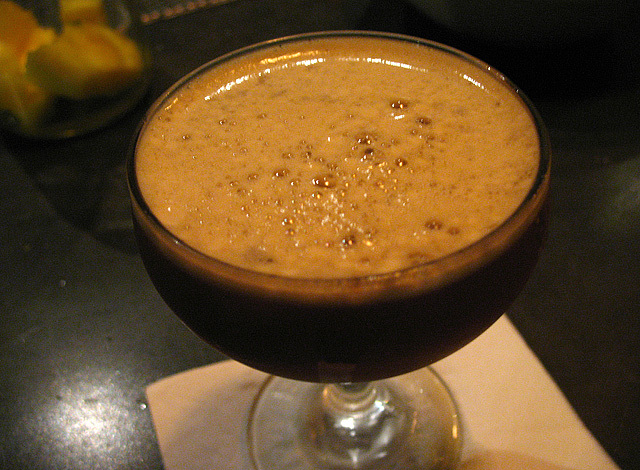 Cox started me with his Daiquiri di Brevetto: J.M Rhum Agricole, Amaro Averna, cane sugar and muddled pineapple. One sip of this Caribbean-Mediterranean summit meeting is enough to be excited about Cox’s approach: the peppery heat of the overproof rhum is tempered by the earthy, bittersweet amaro, and then a taste of the tropics rounds out this superb cocktail. 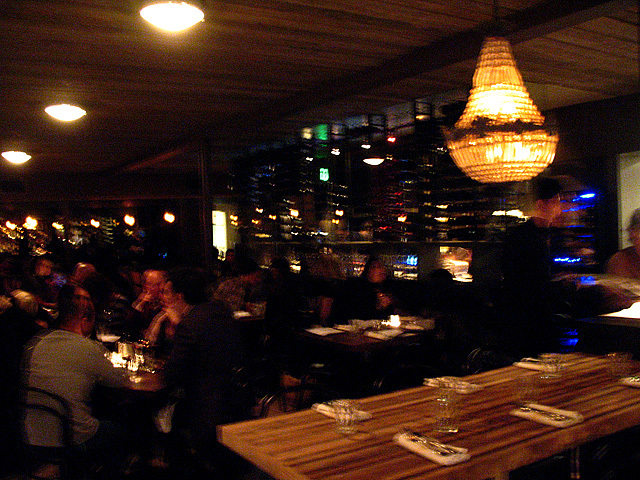 It was an excellent introduction to Sotto’s cocktail menu, which Cox said will feature less than ten drinks when it debuts, with prices around $10-12. ...and minutes later, adding the finishing touches. Between drinks I took an informal poll of fellow patrons, and some of the standout dishes include: sardines alla piastra (Sicilian winter citrus salad, shaved fennel, crushed olive-pistachio vinaigrette); the casarecce with braised lamb ragu, egg, and percorino; and the pizza salsiccia e friarielli (sausage, broccoli de ciccio, mozzarella, chilies). While I was distracted by the piping hot pizzas coming out of the kitchen at a rapid clip, Summers made me one of his Sotto creations, the Típico Italiano: Beefeater Gin, Amaro CioCiaro, lemon and grapefruit juice, and marjoram. 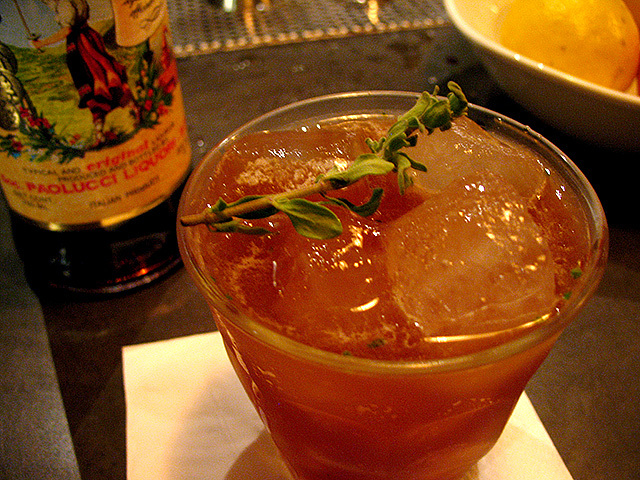 As with Cox’s daiquiri, the herbaceous, bitter amaro anchors Summers’ cocktail, offset by the acidity of the citrus and the oregano-like marjoram. Another great sipper with depth and complexity. 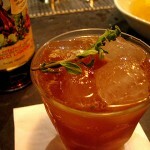 Summers said he’s still fine-tuning the cocktail, but the essential blueprint is there. The visit was brief, but it was long enough to tell me that cocktail enthusiasts and Italian food aficionados alike will be clamoring for a seat at Sotto. The tantalizing glimpse of Julian Cox’s new menu bodes well for his fans, and for those who are unfamiliar with amari, he and his team seemed eager to educate guests. And by “educate,” I mean pour the occasional shot. After all, isn’t that what friends and family are for? Note: as of this writing, the Sotto website isn’t live but the restaurant’s OpenTable page is taking reservations.